Pre-made jewelry findings can be used to finish and enhance chain maille jewelry weaves. A wide range of styles and materials are available to finish and compliment chain maill jewelry. Findings made from sterling silver, gold, gold-filled wire, copper, brass, nickel plated, gold plated and silver plated metals are among the choices available. Glass and metal beads are also used to create original designs and finishes for many weaves. Hand made flameworked beads are very popular with many chain maille artists. Swivel lobster claws are a good fastener as they are simple to fit and always lay straight. Lobster claws come in various sizes and styles. Multi-strand weaves can be finished with multi-strand slide clasps that provide a neat finish to the chain. There are some nice box clasps available for lightweight bracelets and necklaces; however, the weight of some chain maille jewelry will quite often cause a box clasp to open. Toggles, lobster claws, spring rings, ‘S’ clasps and multi strand slide clasps are far safer and generally will not open of their own accord. If you wish you could make your own fasteners from wire, ear wires and headpins to attach glass beads or other items to ear wires or to bracelets and necklaces can also be made. All these items can be purchased from online stores if you so wish. Glass beads or Swarovski crystals can be used during the making of a bracelet or necklaces. There are a number of weaves online as well as books covering the use of beads. Handmade flame worked focal beads are quite often used to highlight a bracelet or necklace. 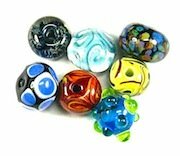 There are many great local artists making brilliant flame worked beads. Glass fused dichroic beads can also used as a focal bead. Genuine Murano beads, although expensive, add a great finishing touch to a chain maille weave. 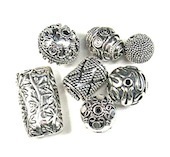 Bali sterling silver beads can also be included in your weaves, there is an extensive range available. Cheaper imitation base metal beads are also available as well as metal beads of all shapes and sizes. A wide range of Balinese sterling silver jewelry findings can also be purchased. Many open weave chains are great for making charm bracelets using bought charms, or charms possibly made from precious metal clay or your own metal designs.